The amazing Greece, the cradle of Western civilization. The birthplace of democracy, western philosophy, western literature, major scientific and mathematical principles, western drama, and the Olympic Games. This is a country of wonders and legacies reflected on its numerous ancient sites that still sparks the curiosity of humanity. At the world's greatest beauty contest, Greece's legacy started in 1953 and it includes Irene Skliva, who won the Miss World title in 1996. This year, Hellas will be represented by Manto Gasteratou who won the Miss Hellas 2010 crown last summer. TimesOfBeauty.com proudly presents Miss Hellas 2010 in an exclusive interview for our series Meet the Misses. I was born in Athens 22 years ago and I still live there with my parents. I am currently pursuing a Bachelors degree in Philosophy and History of Science at the University of Athens. In parallel I am studying psychology at the Mediterranean College in Athens. My intention is to continue my studies and acquire a Master degree in Paedagogics. I started working as a model two years ago. It’s a fascinating job, because it allows me to meet different people from all over the world. Greece is a wonderful country with a great, three thousand-year-old history. It is considered the birthplace of the European civilization and of the very European idea. Thousands of miles of coastline and high snowy mountains create a unique and charming contrast. 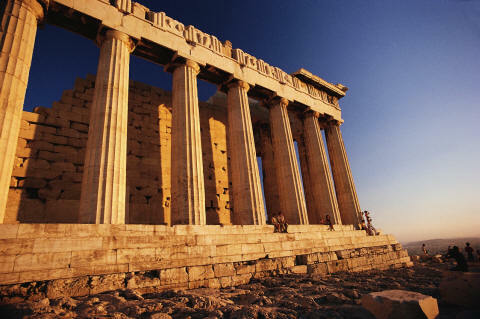 Athens is the capital city of Greece and a lively Mediterranean metropolis. Restless, even exhausting sometimes, Athens still remains fascinating and unpredictable, an attraction for millions of tourists. Representing your country is always a great honor accompanied by a great responsibility. Winning the competition would be perfect, an ideal opportunity for promoting my career! This beauty pageant also means promotion and publicity for my beloved country, something which is equally important to me. Physical exercising, watching my diet and, of course, modeling, are the main parts of my preparation for the final. I also watch videos from past competitions. Valuable support to my effort comes from Antenna – the Greek TV channel that is broadcasting the Star Hellas-Miss Hellas pageant – and Mr. Vassilis Prevelakis the National Director of Miss Greece Organization. I think the greek word that describes me better is ðñïóçíÞò (prosinis) which corresponds roughly to the english amiable, friendly, gentle, gracious. I’ m a person very sociable and easy to get along with. I see myself having a large happy family, a husband that I love and two or three adorable children. This presupposes of course a successful modeling career. I admit that this is a difficult choice, but I would prefer the second. I consider intelligence more important than beauty and money. Of course, beauty is not a negligible advantage and no one should feel shame for being beautiful. I admire George Papandreou, the Greek prime minister. Greece is now on a difficult situation and faces a debt crisis. Papandreou gives a formidable fight in order to deal with the problem. I would probably choose some other Mediterranean country, with a climate similar to Greece’s climate. But I think I could move anywhere, on one condition: to be with people that make me happy. Famine and malnutrition in large parts of the Third World. I think that the Western governments should offer relief by canceling the Developing Countries’ debts. A beauty queen is a public figure and an icon. She therefore has to be careful not to offend anyone by accident. This does not mean that she has to suppress her personality. Self-censorship has its limits. I’m looking forward to meeting interesting persons, making new friends and learning many new things from them. The former winner I admire most is Irene Skliva, who won this highly regarded contest in 1996. This is the only Miss World title won by Greece till date. Skliva has participated in some of the world's largest fashion shows and she also has a happy family. Beauty is a gift and this gift should be used for a cause. We, the candidates, are in position to make significant social contribution. For example, we can take advantage of our publicity in order to contribute in the preservation and protection of the environment.